Every year, thousands of visitors stroll the paths at Grant’s Farm. This St. Louis, Missouri tourist hot-spot sees a peak in foot-traffic during the hot summer months. 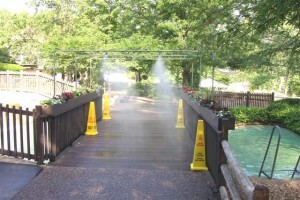 To provide relief for visitors, a cooling zone was installed by mounting misters over a wooden bridge. While the mist undoubtedly cooled farm-goers, it presented another risky problem – the wet wood was increasingly slippery! PEM Surface Creations had the perfect solution! The heavily-traveled footbridge was covered with our green High Friction Matting. 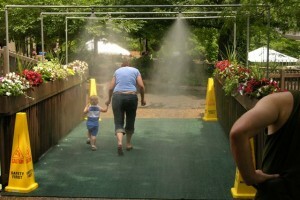 It was the perfect solution for children and adults who sought relief from the relentless rays under the cool misters. How did our matting hold up? We hoped you’d ask! After 6 years at Grant’s Farm, we are proud to report the matting has only required one inexpensive, small corner repair. That’s right – our high-quality matting has stood up to thousands upon thousands of feet marching across the bridge, year after year! The matting was installed using a combination of adhesive and screws, ensuring a flat, safe, snag-free surface. To learn more about our matting or speak to a PEM Representative, contact us today!